Electronic Arts' first foray into the battle royale space has everyone talking. From its surprise launch to its rapidly growing userbase, Apex Legends is comfortably one of the most talked about games of the moment. Perhaps this was inevitable. In his 9/10 review for IGN, Steven Petite describes the game as "something of a zeitgeist stew" -- combining battle royale with Overwatch-style hero characters, plus games-as-a-services hooks like weapon skins and emotes, a year's worth of planned seasons to drive engagement, and even loot boxes. "None of those borrowed ideas scream originality on their own, but here they come together as something totally new thanks to a roster of personable Legends, a single lavishly designed map, and a smart approach to its mandatory three-person squads," he writes. "Apex Legends has burst onto the scene as one of the most refined and entertaining battle royale games I've played"
"Add great gunplay, a groundbreaking communication system, and a degree of polish that's all but unheard of in this genre, and Apex Legends has burst onto the scene as one of the most refined and entertaining battle royale games I've played." This certainly seems to be the consensus, with the most common praise for the game being the high quality. Respawn said development began in spring 2017, which would explain the level of care taken with the game. In his hands-on for Push Square, Liam Croft says Apex Legend is "more polished or refined in areas that its competitors fall short in." Phil Hornshaw, who gave the game a 9/10 in his GameSpot review, agrees and adds that perhaps the best aspect of Apex Legends is "that the game is complete -- something not all battle royale games can boast." He continues: "Moment-to-moment, what's remarkable about Apex Legends is that it just works. Battle royale is a bit of an obtuse genre with a lot of moving parts; in most games, you find weapons, gun attachments, armor, healing items, and more. You'll spend lots of time digging in menus to manage inventory. "Apex streamlines all of that with user interface tweaks that make it possible to instantly identify what you need and ignore the things you don't... It's an even more accessible version of Call of Duty: Black Ops 4's battle royale improvements with its Blackout mode, and the rest of the genre should adopt it." Over at GamesRadar+, Ford James praises Respawn for creating a game that has "none of the early access teething problems going on". While he acknowledges there are a handful of bugs, it feels a cut above the other recent entrants into the battle royale space. He also addresses that fact that, while it's set in the Titanfall universe, the series' hallmarks of Titans (the titular giant mechs) and parkour-style movement system that includes wallrunning are absent. 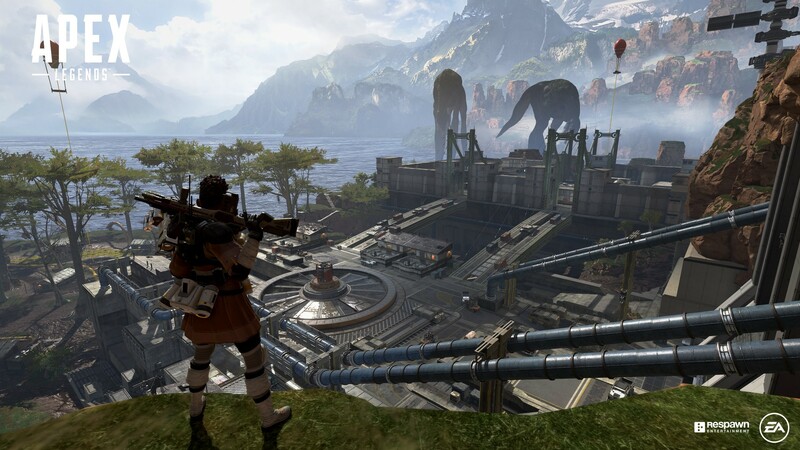 In his 5/5 review, James says this is understandable as it adds to Apex Legends' feeling of balance. "Respawn's intense focus on team play makes Apex more than just a worthy addition to the genre; it's an indicator of where battle royale should go in the future"
"In a multiplayer arena shooter, if you die to someone who flies around the corner and blasts you in the face with a shotgun, you can say 'well played' and quickly respawn to go and get revenge," he explains. "Battle royale games don't work that way. You could spend up to 15 minutes looting up and searching for the right gear, then for you to be killed in an instant by someone essentially flying around the map would be nothing short of infuriating. The lack of fall damage and ability to scale walls still creates a fluid movement experience that you'd expect to find in a Titanfall universe game." Naturally, the combat and gunplay is championed for building on the foundations laid by Titanfall and its sequel, but it's the newer mechanics that have most impressed critics. One in particularly stands out: the ping system, a non-verbal communication system that enables squads to work together more efficiently. A simple tap of the shoulder button will mark items or locations of interest, with the recorded dialogue adapting depending on the target ("Hey, I found a weapon", "There's armour here", etc). There is a menu for other commonly needed commands and instructions, all handed in-game without the need for going to a map screen. Petite was "genuinely amazed at how advanced this incredibly simple-to-use system feels", adding: "I've marked unassuming enemies closing in on our location and watched as my teammates converged on their location from different angles, flanking them without so much as a single word spoken. Likewise, while your search for loot may be turning up nothing but measly pistols and loads of attachments you can't use, one of your teammates might find and mark a useful SMG for you to grab." Hornshaw adds: "The system is so responsive and well-implemented in Apex Legends that it can fully replace talking to your team at all. In fact, the accuracy of a ping on-screen can often be better at helping you quickly convey information than talking." 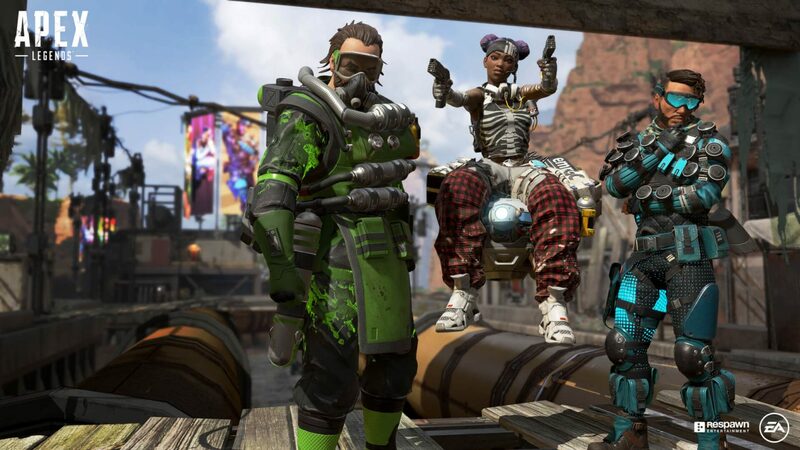 The focus on teamplay is also a popular decision, helping Apex Legends differentiate itself from the majority of battle royales where players can often find themselves working alone, even if they're a member of a squad. In particular, there's been a warm reception for the respawn system that enables a player to carry their fallen teammate's banner to a beacon that will summon them back into the game -- in Apex Legends, down does not always mean out. "It moves the genre away from the more run and gun action of PUBG and Blackout and further into a space of its own, one where you do have a chance of fighting back if someone gets the drop on you"
Likewise, the use of hero characters instead of random avatars has been praised, with each Legend's unique abilities mixing the combat up considerably. Far from being a flashy gimmick, Croft says these powers "have a dramatic impact on how a battle royale match would typically play out." He continues: "It moves the genre away from the more run and gun action of PUBG and Blackout and further into a space of its own, one where you do have a chance of fighting back if someone gets the drop on you... There are so many ways to tackle an engagement, no matter whether you're the one attacking or on the receiving end." Most of the reviews summarise the monetisation mechanics, but there is little to no negativity surrounding them -- an impressive feat given the current climate. In fact, James says it's "most baffling" how Apex Legends comes without a price tag, again pointing to the title's high quality. "With almost two years of development time at a AAA studio made up of industry veterans, without even launching in early access, it is a miracle that Apex Legends is free-to-play," he writes. "Everything about the game feels like the devs have dedicated most of their time play testing, and the result is an immaculate battle royale that should only get better as the months roll on." Even the manner in which it has been released garnered praise, with James declaring the decision to make a surprise launch "a resounding success." It's fair to say Apex Legends has won over critics and, judging by its initial performance, the public as well. But rather than being hailed as a refinement of the 'last man standing' concept that has swept the industry these past two years, it's instead championed as indicative of the model's future. "Apex Legends is a mix of smart shooter ideas that makes for a competitive, team-based game that gets at all the best parts of battle royale while addressing a lot of the weaknesses," writes Hornshaw. "Respawn's intense focus on team play makes Apex more than just a worthy addition to the genre; it's an indicator of where battle royale should go in the future." Croft concludes: "Even when you move away from what makes Apex Legends unique, it's still an absolutely solid battle royale title at its core. Guns feel great to shoot and Titanfall's movement system carries over to a point. It's a cohesive free-to-play title that has its heart in the right place. With a Battle Pass to come and a seemingly fair microtransaction economy to power it, Apex Legends has all the means to be a game we hear about consistently for the years to come."